The solemn celebration opened with the procession followed by the festive Divine Liturgy. The prayers were offered for the health and many good years of His Holiness Patriarch Kirill of Moscow and all Russia Shepherd of the Russian Orthodox Church, His Eminence Metropolitan Hilarion, First Hierarch of the Russian Orthodox Church Abroad (Ruling Bishop of Pakistan), for the Orthodox clergy and faithful, peace, unity, brotherhood and solidarity throughout the world. The faithful entered the place of worship holding banners and icon of St. Michael the Archangel. 1. The prayer of Saint Michael the Archangel! 2. 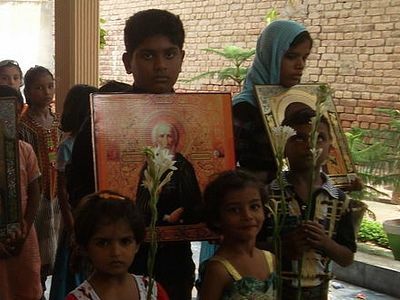 Thanksgiving words for the Russian Orthodox Church outside of Russia who has completed four years of dynamic presence in Pakistan. 3. The national flags of Pakistan and Russia to mark the spiritual unity with the Mother Church. After the Divine Liturgy, Fr. 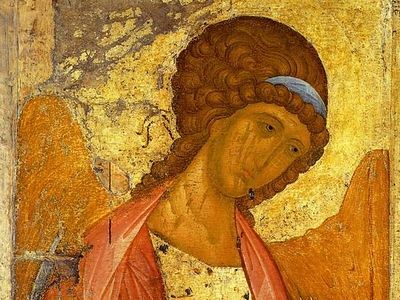 Joseph delivered a sermon about the work and sacred responsibilities of the Holy Archangel Michael and the other bodiless Hosts of Heaven. Fr. Joseph told faithful that the Holy Archangel Michael is the head of the entire heavenly host, and explained the icon. Fr. 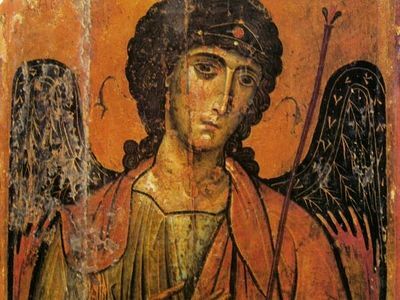 Joseph said that Holy Archangel Michael holding a sword in his right hand depicts that he crushed Lucifer, and the palm branch in his left hand signifies that he is the guardian of the Orthodox faith and a fighter against heresy. The Holy Archangel Michael, one of the highest angels, remains faithful to the Creator. Further, Fr. Joseph told the faithful that we must follow the true traditions of holy Orthodoxy in our daily lives and always remain faithful to the Russian Orthodox Church, because these days holy Orthodoxy is being attacked from all sides by schismatic and heretic forces. We must condemn the forces of the devil, and follow the example of the holy archangel of God Michael and his entire heavenly host, who battle against dark forces. After the sermon the icon of St. Michael the Archangel was placed on the table and time was given to the faithful to light candles, lay down flowers, and seek help and protection in silence from St. Michael the Archangel for their families and the Orthodox faith. 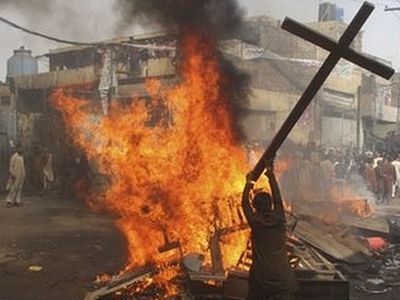 In Pakistan, Christian communities hardly get the chance for celebrations, where they can express their joys and happiness. Christians are extremely crushed, facing sufferings and persecutions, so I personally experienced and keenly observed that the feast days celebrated in the Orthodox Church with her unique traditions fill the hearts of people with true joy and blessings of the Heavenly Father. It is worth mentioning that on November 23, 2014, the faithful were so excited and happy that they reached the place of worship two hours before the actual timing. The women and children dressed in bright colors and their faces were glowing with happiness and joy. The faithful shared the festive lunch at the end of the feast. The celebration of the feast took almost five hours. I extend my thanks to Denny Sellen and his family who sent help for this feast day. I am also grateful to the generous supporters and well-wishers of the Orthodox Mission in Pakistan. I take this opportunity to thank my team members, such as Aaron Nadeem, Azar Murad, Andrew Yousaf, Azad Francis, Peter Saleem, and Alex Rustam. I am thankful to Tahir Naveed (Chairman of Pakistan Minorities Alliance) who joyfully contributed to the feast day. At the completion of four years of the St. Michael the Archangel Orthodox Mission in Pakistan, I extend my heartfelt gratitude to His Eminence Metropolitan Hilarion, First Hierarch of the Russian Orthodox Church Abroad for his blessings, encouragement and pastoral care. We are also thankful to Rev. Adrian Augustus, the first ROCOR missionary to Pakistan—he is the one who planted the seed of the holy Orthodoxy in Pakistan. I humbly request you to help the mission through your kind donations and charity. ROCOR Church in Pakistan is moving ahead day by day!!!! GLORY TO GOD! GLORY TO JESUS! 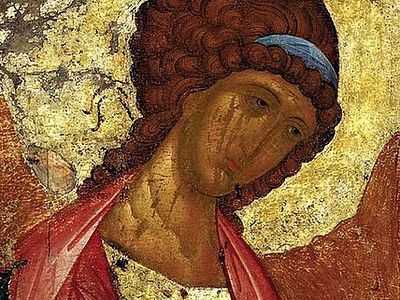 The Synaxis of the Leader of the Heavenly Hosts Michael, and the Other Heavenly Bodiless Hosts was established at the beginning of the IV Century at the local Laodician Council, which occurred several years before the First Ecumenical Council. 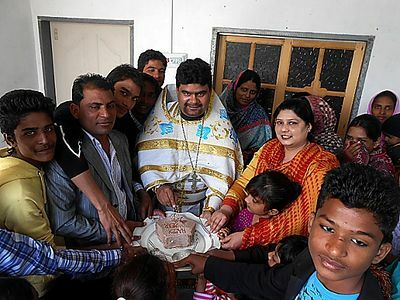 Very nice Father,God bless the orthodox in Pakistan!